The Spring 2018 edition of Communities, focused on “Class, Race, and Privilege,” is now available by donation for digital download. We are experimenting with a new donation-based model for supporting the digital version of the magazine, in hopes that it will greatly expand distribution and readership. Please let others know about this offering, whether through word of mouth, in blogs, in social media, or in any other venue through which you reach people who might benefit from reading Communities. 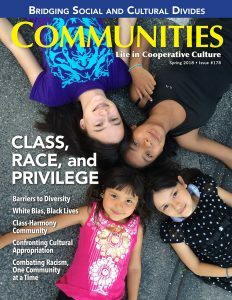 We believe this issue has relevance far beyond the world of intentional communities, which serve as microcosms for dealing with these core social concerns. The issue looks unflinchingly at a major “elephant in the room”—the relative lack of racial and class diversity in most ICs, at least in North America—while suggesting ways of recognizing, understanding, and addressing it. Authors share stories of obstacles they’ve encountered (from both sides of the privilege equation) and positive steps they and their groups have taken to move toward greater inclusivity and equity. They also reflect honestly on the deep-rootedness of unconscious racism, of social and cultural barriers, of problems of power, privilege, classism, “white fragility,” and more. You can download the digital version or order the print version here. ← The Wisdom of Communities is coming – will you help us reach our stretch goal?